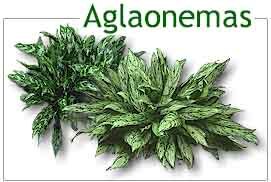 Aglaonemas are one of the most preferred plants for indoor use. They have few pest problems and will tolerate relatively low-light levels. The common name for Aglaonema is Chinese evergreen due to its cultivation in China for centuries prior to its introduction to Europe and the Americas. The scientific name means, in Greek, aglos (bright) and nema (thread). They are related to both philodendron and spathiphyllum and their native habitats of rainforests and swamps helps explain their hearty appetites for moisture and humidity. This doesn’t mean that they live in a swamp indoors!!!! Depending on your indoor environment check the water of your aglaonema every week. Many homeowners over water their plants and keep the soil soggy. Do not let chinese evergreen stand in water. Soil should be moist but NOT soggy and never let the soil completely dry out.